Our exercise was to put to sea and then approach an isolated beach, Slapton Sands, in southern England and make a landing under simulated enemy opposition. Our part of the operation was fairly routine. However some non-routine firing was observed from our topside but we did not have a clue of what was happening at the time. Our ships of the line were scheduled to bombard the beach before our landing craft went in but some of the fire power was not directed in that direction. We maintained radio silence and did not receive word of what was happening until much later. Nine German E-boats stationed at Cherbourg were apparently aware of the operation and dashed in between the patrol ships to attack our convoy. They selected a group of eight LSTs as targets and successfully launched torpedoes against three of them. LST-507 and LST-531 were sunk. LST-289 while firing at an E-boat was hit by a torpedo and despite suffering a number of casualties, managed to beach successfully. This saved the remaining troops and crew as well the military equipment but the LST was too damaged to be available for the Normandy invasion. The remaining LSTs fired vigorously at the E-boats without success. 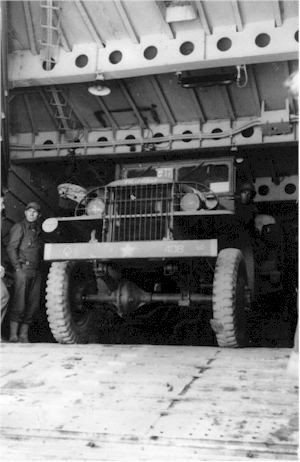 At this time the LSTs were only equipped with 20 and 40 mm anti-aircraft weapons. The single 3 inch cannon which was part of the original ordinance had been removed and replaced with a dual 40 mm Bofors battery. In this exercise 197 Naval and 441 Army personnel lost their lives. It turned out that this was greater than the actual losses on D-day at Utah beach. It was reported that many lives were lost because both soldiers and sailors were reluctant to abandon ship. When we returned to our berth in the Salcombe estuary we received orders to have an abandon ship drill. The water was 56 degrees fahrenheit and this order was not appreciated by officers and crew alike. However an LCVP was lowered to pick up the men from the water and we all donned life jackets and jumped from the main deck (about 14 feet above the waterline). The Captain (LT. Sullivan, USNR) made a little speech and said it was tradition for the Captain to be the last one to leave the ship but he had some pressing work to take care of and set an example by being the first one to jump overboard. I followed later remembering to grab the collar of the life jacket with my right hand to keep it from being forced up over my face by the impact of hitting the water. The left hand was used to cover my crotch for obvious reasons. All went well but as I recall one doctor and the chief pharmacist mate disappeared until the exercise was over. The 56 degree water still sticks in my mind and remains the standard as being too dammed cold. Troops and vehicles "hitting the beach" at Slapton Sands. The next time was for real and not very pretty! 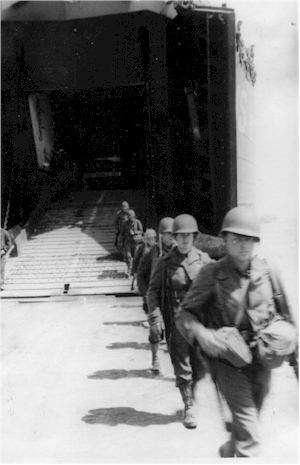 These photos were taken by Truman Cummings, Navigator of the LST 50 until the end of the War. During the occupation he became the Skipper and the 50 was a mail ship. Note: Fabius was a Roman General who avoided meeting Hanibal in a full fledged battle but instead wore him down with skirmishes and eventually prevailed. He was a model for George Washington's strategy against the British.